This weekend ASB hosted the Future Forwards Summit. This was a global conference on educational innovation with the mission of empowering schools in developing their capacity for innovation. The goal was that the 15 schools who attended would leave the summit with their own prototype model of an R&D department for their school. A lot of important ideas in education, that don't exist at your school, don't need to be researched, they simply need to be implemented. So, are you "researching a new topic and exploring new frontiers" or are you designing an implementation plan for something that is best practice already but doesn't exist at your school? A great question - that gets right to the heart of why we have an R&D department that focuses on innovation and exploring new frontiers in education. 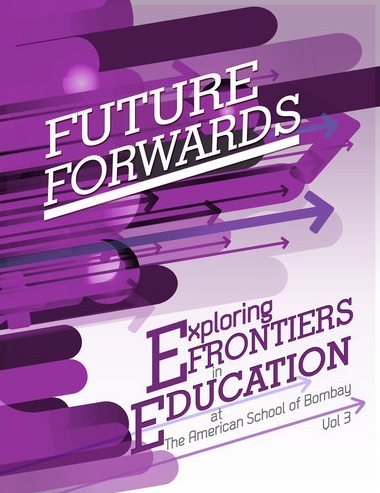 The Future Forwards Summit coincided with the publication of the 3rd Volume of Future Forwards. These books are collections of thoughts, hypotheses, discussions and reflections on practices, research and ideas that are relevant to emerging new paradigms of teaching and learning. The books are divided into 3 sections: Paradigms, Ideas and Practices. These chapters are about paradigm shifts - different approaches that radically challenge established conventions. Here you will read chapters about relevance in a global educational ecosystem, the impact of a school R&D department, essential conditions for effective R&D in schools, the Global Recruitment Collaborative - a new way of dealing with the "talent wars", rethinking PD for the future, and how personal learning devices can personalize learning. These chapters are about how current research is changing or impacting existing practices or established norms. Here you will find chapters on using visual analytics to support student learning, using technology to shift culture in a local Indian school, and the TRAI (technology, robotics and artificial intelligence) Summit. These chapters describe the application of an instructional practice in a completely novel way or the successful mash-up of different practices. In this section you will read about how our tech audit has transformed the personalization of tech PD, accelerating and innovating intersessions, learning analytics and data visualization in a 4th Grade class, exploring wellness data, new media in art and Maker Saturdays. These eBooks are completely free - enjoy and please consider sharing them with others in your professional network.